Are you ready to achieve your fitness goals whenever and wherever you want? 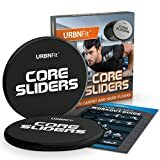 With the URBNFit Core Sliders, you don’t need a big gym – or even a little gym – to work out and start seeing results! Now you can include challenging low impact exercises into your workout routine without the need for heavy equipment.